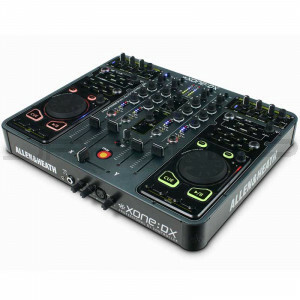 Designed by Allen & Heath in collaboration with Serato, the Xone:DX is a MIDI controller and USB soundcard with total integration for ITCH software. Boasting a huge number of MIDI control messages, inputs for external decks and two dual layer deck simulators, the Xone:DX is the most powerful ITCH controller on the planet. The brand new version of Serato ITCH, supplied with the DX, provides unique 4-deck control, and features a comprehensive set of digital DJ FX, as well as looping, time stretching and a massive number of DJ tools.